On the train to Lhasa, I had to sign a plateau travel health declaration. Among other things, I had to certify that I am not a "highly dangerous pregnant woman" and that I don't get "the heats are above 100 times per minute". I can see how that would be very exhausting. The Chinglish is getting better all the time. 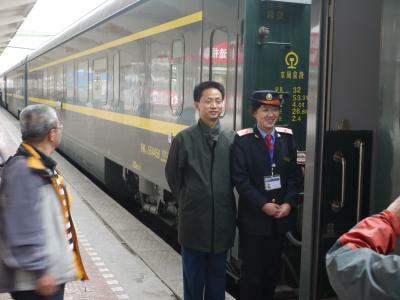 The train is quite new; the line to Lhasa was opened only the year before. 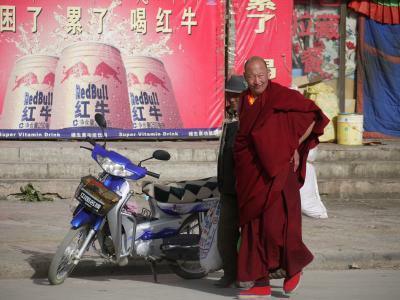 Many Tibetans are not happy about it because it encourages even more Han Chinese to settle in Tibet, making the Tibetans a minority in their own country. The train itself looks new yet designed 20 years ago, not unlike East German train cars except that there is no cheap fake wood. There are sinks and moderately clean toilets, and a bistro car. 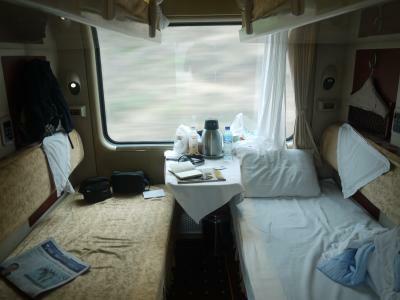 I got the equivalent of a first-class compartment (they call that soft sleeper), expensive but worth it. Each bunk has its own TV; I watched Harry Potter in Chinese. Each bunk also has an oxygen socket, they hand out "nasal oxygen cannulas". The train runs smoothly, and I slept well. I kind of expected dramatic high mountain scenery of the kind I visited in Kashmir, but the scenery is mostly flat plateaus with mountains not so very much higher on the sides. 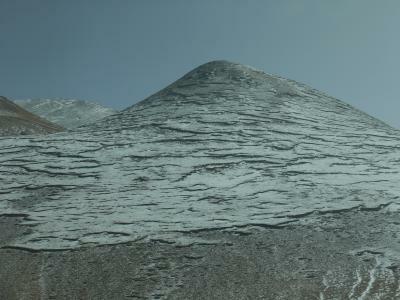 Snow started to appear at an altitude of 3000 meters. The next morning I woke up at an altitude of 4700 meters, and when it reached the highest pass at 5072 meters there was an announcement. It's the highest train pass in the world. The train is not pressurized; the train toilets have open windows (which is a blessing on a 46-hour train ride). I had never been much above 3000 meters. I don't get altitude sickness, but I got out of breath quickly, and had to breathe deeper and faster than normal. But not the way one does on a hard bicycle ride, where your lungs hurt - it's just like normal breathing, only more of it. Strange. I am too macho to use the nasal oxygen cannula (but there really isn't any need). The train restaurant's idea of twice-cooked pork is a big quivering mass of pork belly fat without any discernible meat. The vegetables were good though. Close to the Tibetan border, my cookies exploded. (Go ahead, read that sentence again, it may be a while before you come across one like that again.) They are shrinkwrapped and the air trapped inside expanded at the high altitude until the plastic ruptured. I have a pre-explosion picture where the formerly tightly packaged cookie roll looks like a blimp. Ok, it was more a pop than an explosion. I was picked up at the Lhasa train station by my guide for the next week. He is Tibetan, quite young, speaks five languages, and is very friendly. I was trying to be careful to avoid mentioning touchy political issues to him - if someone overhears a Tibetan and a European to talk in a foreign language, using words like "Dalai Lama" or "Dharamsala", he could be in trouble. Inside monasteries that's ok, he is doing his tour guide duty, but elsewhere it's suspicious. It is quite possible that I know more about Tibet's history than my guide, because all the books that I have read are censored and unavailable in Tibet. There are reports that even Lonely Planet guidebooks have been confiscated because they contain a foreword by the Dalai Lama. I was staying at the Kailash hotel, booked by the Chinese agent in Beijing, an uninspired modern but comfortable (except for the barely functional shower) affair whose main distinction is its bizarre English brochure that ends with the words "Wish that you prick the West Germany bridle". Lhasa, and Tibet. These names have always held a mysterious fascination for me, and I have wanted to be there for many years. I have read books about the history, culture, and religion, some written by the Dalai Lama and other monks and scholars. 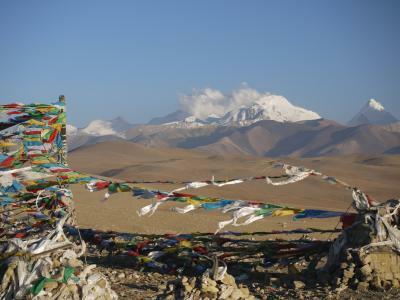 Of course I realize that the romantic notions of a Shangri-La on the roof of the world no longer exist, and likely never existed, but the fascination remains. 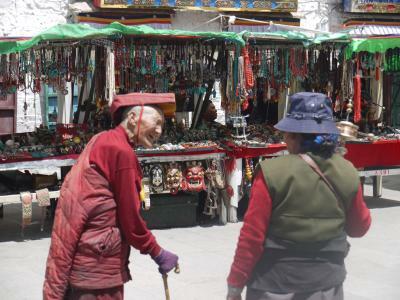 Lhasa is certainly not just another tourist destination, and in fact there are very few tourists here, but very many pilgrims. The Chinese occupation might be secular, but for the Buddhists, Lhasa, Jokhang, the Potala, and the Dalai Lama (here always referred to as "his holiness") are no less holy than before the invasion. 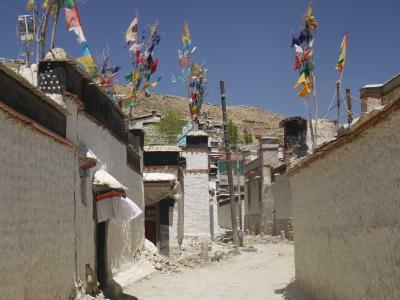 Lhasa is a magical, mysterious, ancient, and very remote part of the world. Let the adventure begin! 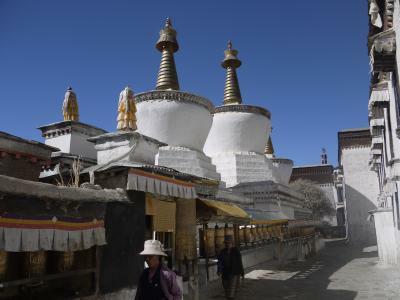 Lhasa has a forgettable Chinese new town, and a Tibetan old town called Barkhor that is centered on the Jokhang monastery. The first thing you see is people prostrating themselves at the entrance, flat on the ground. The main room inside is dark and gloomy, with a big golden Buddha in the center. People move clockwise around it and visit the many little shrine rooms adjoining the hall. Large stone bowls are filled with liquid Yak butter used as candles; pilgrims constantly refill the bowls from their brightly colored plastic thermos cans. We had lunch at an old Tibetan restaurant: Yak butter tea, Yak meat dumplings, potatoes filled with minced Yak meat, and sliced Yak meat. Yak Yak Yak. Tastes great, except it turns out I don't like Yak butter because of its slightly rancid taste, let them burn it. 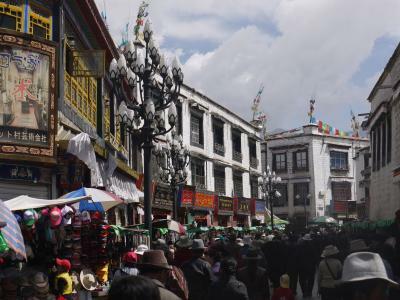 There is an inner alley ring around Jokhang that is for tourists, mostly pilgrims and some Chinese. 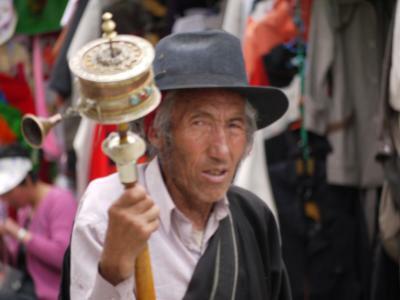 The #1 article is prayer wheels, lots of people here who keep spinning them. I exhausted the souvenir circuit, checking every stall and every shop in an unsuccessful search for a specific article. I got hundreds of "hello lookee" calls for my trouble. I am fairly certain I missed nothing because tourists don't stray and don't explore. Just five meters away from the circuit the prayer wheels and other souvenir junk disappears instantly and sensible things like shoes and flashlights are sold. Bought a golden mandala. At every entry to the old town, at all major intersections inside, and in all large squares are posts with five or more policemen, an euphemism for Chinese army. I saw two policemen in riot gear too. I was warned that they must under no circumstances be photographed. 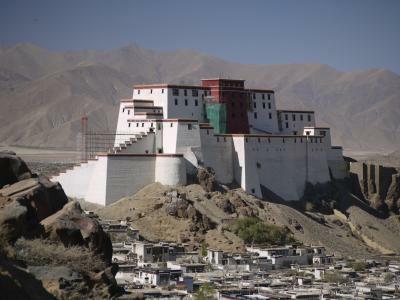 The Potala Palace is certainly the most famous building in Tibet. 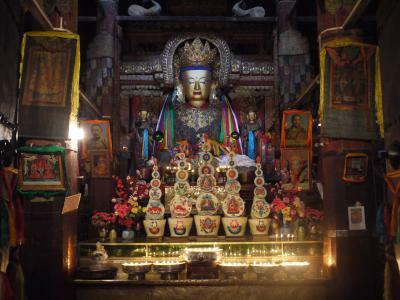 Ten of the fourteen Dalai Lamas ruled over religion and the country from here. It's supposed to have 999 rooms but it felt more like 999 stairs in the thin air. Most rooms are closed to the public; the Potala is no longer a center of government so many rooms are simply empty or used for storage. Many rooms are quite small, including the personal apartment of the Dalai Lama. At the top of the palace is the Dalai Lama's throne room. Unlike much of the rest of the palace, the top throne room is bright and airy, with windows on both sides. A guardrail runs around the throne to keep visitors at the edge of the room. There is a huge pile of donated money in front of the throne; I estimate about half a cubic meter. Of course it all goes to the government and not to the Dalai Lama it was meant for. The donation ritual has no purpose anymore but it lives on. 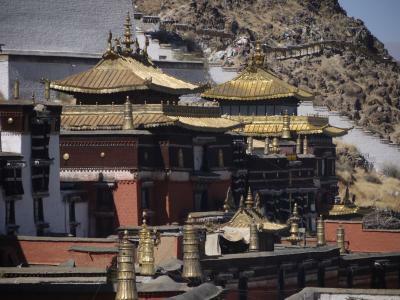 Further down, there are more large throne rooms, and several long and high galleries with Buddhas, other statues, and the tombs of several Dalai Lamas. 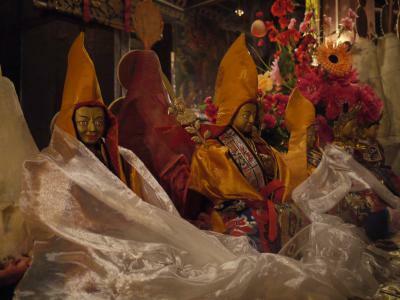 The 5th Dalai Lama has the largest; he unified politics and religion under his rule by calling in his pal, the Mongol emperor, to do the dirty work. All walls, columns, and the roof are brightly painted or hung with brightly colored silks, in the five colors that symbolize the elements - red for fire, green for water, blue for the sky, white for clouds, and yellow for the earth. There are many small tapestries hung from the ceiling that look like necktie shop displays. 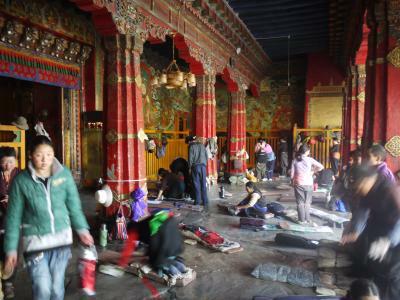 Despite the bright colors, the rooms look solemn and a little gloomy; all light comes from a few lightbulbs, and the ubiquitous Yak butter lamps. Professional lighting would work wonders on the Potala, but professional lighting is unknown in China. Only the top throne room in the Red Palace on top gets bright light from windows. All the decorations on the walls, columns, and ceilings are brightly painted with the five colors representing the elements: blue for the sky, green for water, red for fire, yellow for earth, and white for clouds. Many walls are covered with bright silk pictures in the same colors. Circular tapestries that look like necktie displays hang from the ceilings. My guide is great - he is Tibetan and explains the things that really matter, while the English signs and the Chinese tour guides are rattling off facts like how many square meters a room has, how many ounces of gold were used on a Buddha, and how much the things are worth. It became a running gag between us; I'd eagerly point at Mount Everest and ask how many ounces of ice were used, and he'd pretend to know the answer. He kept translating the explanation of the Chinese tour guides, and is annoyed when he catches one who is describing the wrong statue or even temple. Like the other Tibetans, he prayed at various shrines. We had a quick lunch at a family restaurant, in a courtyard behind a low building near the Potala. It has some benches and low tables under a corrugated metal roof. Foreigners are not normally allowed to go there, but with my guide it's ok.
We ended the day at the Norbulingka, the Summer Palace, a much smaller palace in walking distance to the Potala with airy bright rooms, set in a nice park. It's for the Dalai Lama only, there are only a few buildings. The decoration is similar to the Potala, but simpler and less overwhelming. 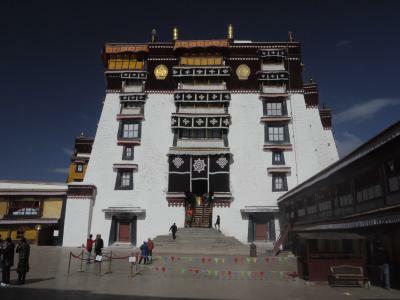 One building finished in 1956 was commissioned and planned by the 14th Dalai Lama who had to flee the country in 1951 before he could use it. 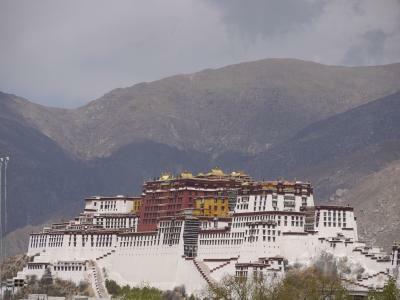 It's modern, large but not imposing, and not anywhere as overwhelming as the Potala. 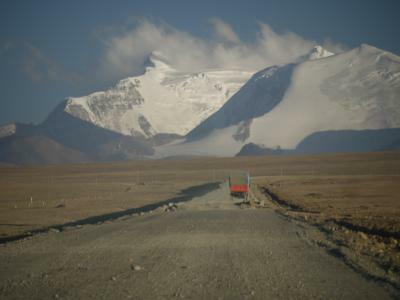 Tibet, roof of the world - I always thought that was hyperbole. 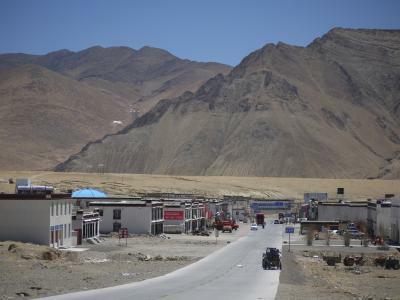 But after our car left Lhasa and climbed out of the Tibetan Plateau to over 5000 meters, passing through valleys with the Himalayan mountains on all sides, I can see how apt the expression is. The horizon is incredibly clear and the sky there is a perfect blue. Looking up and away from the sun, the blue color of the sky turns so dark that it's almost black. There are a few small but brilliantly white clouds, and they seem very close. I half expected the space station to swoosh by. 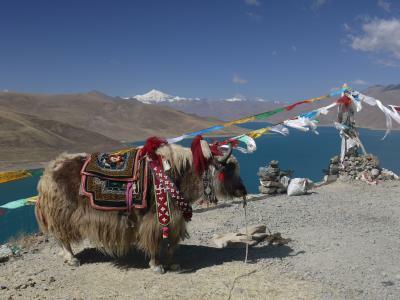 There are lots of beautiful vistas along the way, and little lopsided shrines with prayer flags strung on long lines, and people with yaks trying to get some money from tourists. There is not a lot of snow where we drive but glaciers shine brightly at a distance. After crossing a pass, we had a great view over the deep blue Nam-tso lake at an altitude of 4700 meters, It's the highest salt lake in the world, and largest salt lake in Tibet. There is a vista point at the top, but it's expensive and crowded with tourists so my guide drives on to a better place a little lower. 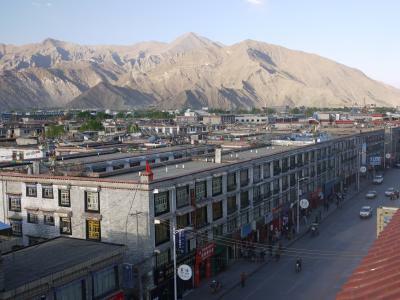 Gyantse is a small town at a mere 4000 meters. It has a mild case of Chinese architecture pest - the roads are too wide and the buildings are mostly new and, yes, sometimes covered with those nasty white bathroom tiles, but few buildings have more than two floors and it all looks like a sleepy village. The main attraction is the Baiju monastery, built up a hil crested by a wall. Many halls and shrine rooms filled with Buddhas and statues; not unlike the Potala but on a much less grand scale. And photography is allowed, after paying a fee (one per room! ), so I caught up a bit. There is also a conical building that looks like a large stupa, and I swear this thing is far bigger inside than outside. It's supposed to contain 100,000 Buddha images and that number can't be far off. Six floors, maybe a hundred rooms with Buddha statues from 1.5 to 6 meters tall, and no wall space wasted. There is also a beautiful view to the steep hill crowned by the governor's palace, but it's being renovated so I skipped it. 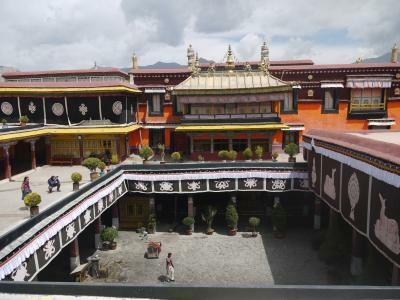 It's a short drive to Shigatse, famous for its large monastery founded by the first Dalai Lama, and seat of the Panchen Lama. The Panchen Lama was selected by the Chinese government, not in the historical way by the Lamas, but people pray to him anyway. The Panchen Lama has no political power though. 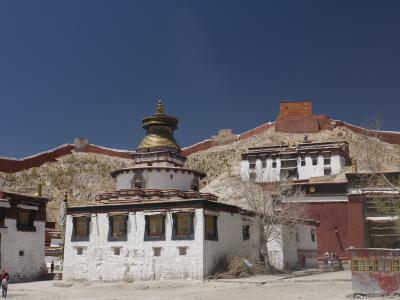 The monastery complex is huge - much of it is old whitewashed quarters for the 600 monks. Three large white stupas are a memorial to the people killed during Mao's cultural revolution; people circle it clockwise (always clockwise...), turn the prayer drums, and keep count with little piles of pebbles. In the main hall is a 26 meter gold Buddha, dimly lit by many butter lamps tended by monks. On the side several old monks sit and chant scripture. Tibet at its best, the effect is hypnotizing. In the next hall they get down to business: there are long benches where a dozen monks sit cross-legged, large scripture books open in front of them. You can make a donation, and the head monk will read your name, donation, and preferred scripture section aloud, and the monks begin to chant that section. They have many very young monks, but they do all the work around the temple while the old monks just sit there and chant. Reminds me of work at home. Another hall houses a huge shrine with a drum on top containing the bodies of past Panchen Lamas. The monastery is beautiful, serene, and a place of active worship. It has impressed me a lot more than the Potala in Lhasa, which is far more imposing but really just a big, dark, and dead museum. I spent the rest of the afternoon walking in the old town at the foot of a steep hill with the governor's palace on top, and circled the monastery on a path just outside its walls, with thousands of prayer drums spun by old women walking with me. Had "yak stronganoff" [sic] for lunch. The next morning, waiting for my guide at the hotel, I watched a Chinese woman reading aloud from a Lonely Planet guidebook. I thought she was practicing her pronunciation, but my guide said that she is a guide too and is memorizing what she is going to tell her customers that day. Who needs a guide like that? A travel day. Tola pass at 4200 meters, Gatso pass at 5200 meters, and later another at 5100 meters. 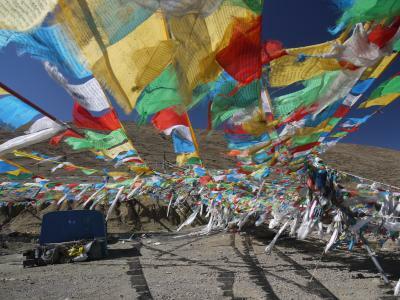 Passes are marked with spiderwebs of prayer flags strung over the street, from poles, or even power masts. The sun is hot but the wind is very cold. None of the blue-black skies again. The mountains are all bare of vegetation, but shine in red, brown, black, and yellow hues. People plough fields with horses, but I don't see any plants. My guide and I have lunch in a Tibetan restaurant as usual, but my driver is Chinese and eats only Chinese food, and only at Chinese restaurants, and speaks only Chinese, even though he has been living in Tibet for five years. So he eats alone every time. 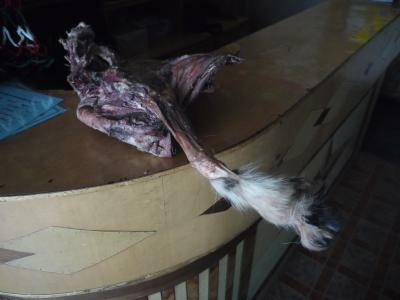 In the Tibetan restaurant, a sheep's dried leg sits on the counter with tufts of hair at the hoof still on it, but most of the meat is gone. Beef jerky Tibet style. They also rent rooms but the bathroom smelled like the sheep died there, so we continued. 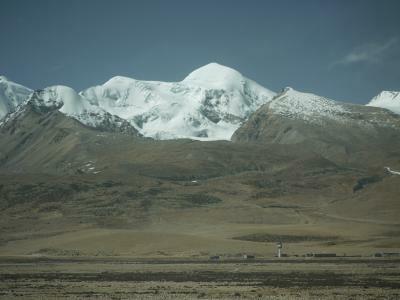 We were supposed to overnight in Tingri, but at 17:00 my guide's agency in Lhasa noticed a mistake in my travel permits - the departure date is wrong, I have to leave the country tomorrow! And they are *very* strict about that. So we packed up and left for the border town of Zhangmu. Tingri is no loss, there is nothing to see there, and I couldn't get the Mt. Everest permit anyway, but we spent a lot of time in the car that day. At Old Tingri, the smooth blacktop road ends and we had to use a dirt road for the next 132 km. Occasionally the road was closed and we had to go off-road; I have no idea how the driver found his way. One day, the road will be open and paved all the way, they are working on that, I have seen several people with shovels! The driver loved to go over bumps at speed, and once we hit a big rock. He decided that we can continue after an inspection. The views of the ice-capped Himalaya range in the evening sun was fantastic, I keep asking to stop the car. There are several police checkpoints. Soon it was totally dark and the ride got interesting. Once we were faced with three huge yaks in the middle of the road after turning a corner, but stopped in time. There are also unlit dogs, horses, and sheep from time to time. Asphalt returned for a short time, but there were rocks that had fallen from the mountain everywhere, so we had to drive slowly. One boulder more than a meter across had smashed through the retaining wall, scattering debris all over the road and coming to rest in the middle of our lane. Just before Zhangmu, we reached a narrow, dangerous, unpaved, and very rutted section of the road. There was lots of traffic going the other way because the road is open only from 20:00 to 1:00, mostly trucks. People with torches ran around, and we needed to inch our way backwards and forwards into tiny turnouts without falling off the mountain to let the trucks pass. My guide said this usually takes 2-3 hours at this point but we managed to pass after less than an hour. My driver really knew his job and didn't mind a smoking clutch. We arrived in Zhangmu at 23:30. They call this the Friendship Highway. Can't be much of a friendship. Zhangmu is built up a hill on both sides that is so steep that the houses seem stacked. In my hotel, what's first floor in front is fourth floor in the back. I had to leave early because the border station is only open in the morning. After the first checkpoint, we walked down a road with many switchbacks (one of which was closed so we had to climb down the side of the mountain for a while) to reach the immigration building, where my guide checked me through the formalities. Then I said goodbye and crossed the Friendship Bridge high over the small river that marks the border. 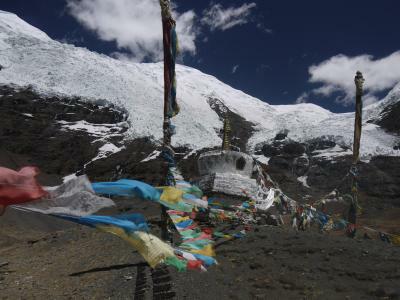 I stepped over the red line in the middle guarded by motionless soldiers, and I was in Nepal.